Organisers behind the annual Stray bonfire on Harrogate are aiming to make next year's even bigger and more spectacular. Such is the event's popularity, cowds for this year’s bonfire on The Stray in Harrogate may have hit new records. Such was the huge size of the turnout on Saturday night, people were swarming across the road and trampling across the bright orange safety fences round the vast perimeter. Some watching events even said the firework display at the end of the event was more spectacular than the one at Roundhay Park in Leeds. Thousands of pounds was raised for local charities, making the event a huge success for organisers Harrogate Round Table. 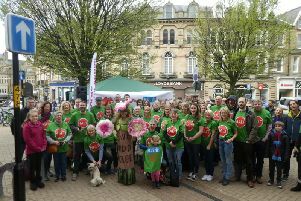 Organiser Josh Lawson from the Round Table said: “We are used to attracting around 10,000 people on The Stray on a good year but this certainly felt much more than that on Saturday. “For us it was incredibly successful. We are still awaiting final figures but it looks like it will be around £9,000 to distribute to the charities. Playing its part as usual was the roadshow from radio station Stray FM. The orange fencing built in a wide radius round the fringes of the part of The Stray between Oatlands Drive and the Empress roundabout was first introduced for crowd safety in 2015. Josh said: “The fence helps us filter the public through set entrances from a safety perspective. The proceeds of the bonfire on The Stray will go to Harrogate Round Table’s three chosen charities - Yorkshire Cancer Research, Our Angels and The Rainbow Fund. Josh said: “Yorkshire Cancer Research has been generating support and investing the donations they receive for 90 years in the fight against cancer. “Our Angels fundraise to provide support and help bereaved families through the loss of their baby. Harrogate Round Table is also grateful to Harrogate Borough Council who gave a £10,000 grant to help with the expense of organising the bonfire. With the council’s support, the aim in future is to make the event even bigger and better.